The release of Chromecast by Google last month is only the latest effort by tech companies to make sure all those smartphones, laptops, and tablets you’ve bought are properly connected and streaming. Some experts envision device owners living in a programmable world in which everything from the coffee pot in your house to the temperature in your office are all personalized and integrated. But there is one segment of the population who would see no benefit in services like these – people who own only one device. In April 2012, the Pew Research Center measured ownership of five different types of computing devices—cell phones, desktop computers, laptop computers, e-readers, and tablet computers—and found that one in ten Americans (13%) only owned a cell phone and none of the other four devices. Seniors, non-whites, those with less than a college education, and those living in households with an annual income of less than $50,000 a year were especially likely to say that they owned only one of these five devices, and that the device they owned was a cell phone. The typical (median) American owned two of the above devices and 17% said they only owned one of these devices. Some 77% of single-device owners said their one device was a cell phone. Another 17% of those with one device said it was a desktop, while 6% said it was a laptop. 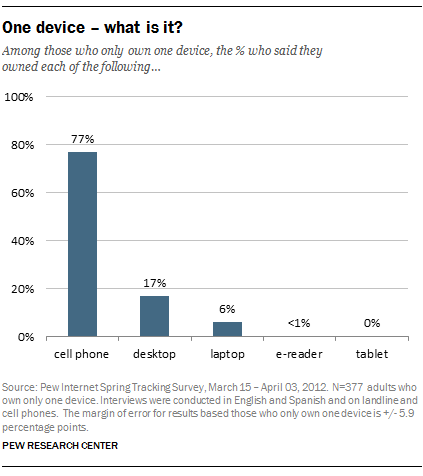 Fewer than 1% of these one-device owners said their only device was an e-reader, and none said that their one device was a tablet computer. As tablet computers and e-readers have grown in popularity, the proportion of Americans who own four or more computing devices has increased. In May 2010, just 4% of Americans owned four or five of the devices we measured; by April 2012, that figure had risen to 20% of all Americans. This accumulation of devices is mainly being driven by the educated and affluent. Looking at 2012 data, almost one quarter (23%) of college graduates own four devices, and 9% own five devices. By contrast, among those without a high school diploma just 4% own four devices and 4% own five devices. Similarly, 28% of those living in households with an annual income of $75,000 or more own four devices and 12% own five devices. This contrasts with the 4% of those living in households with an annual income of less than $30,000 who own four devices and 2% who own five devices.